Ever wonder how your two pound burrito could possibly fit all of those ingredients without exploding? Well, that’s all thanks to masa, the corn flour used to make tortillas, sopas, and pupusas. While solid masa dough is traditionally sold in Mexican grocery stores in the refrigerator aisle, Bob’s Red Mill makes things easier by offering a nonperishable powdered version of the same stuff. In Spanish, masa harina literally translates to “dough flour”, and when mixed with water, transforms into a malleable dough that can be used in a variety of dishes. How is masa harina made? What is it used for? To learn more about the science behind masa (which involves the process of nixtamalization) Kat interviews Dave Arnold, co-host of Cooking Issues. Masa and cornmeal are made from the sameprimary ingredient, but they are processed quite differently and have different outcomes when cooked. After corn is softened by lime water, some of the oil is broken down into emulsifying agents, and corn proteins are bonded to each other in the process. That’s what makes it possible to form a dough from masa without introducing a bonding agent, such as the gluten in flour. To get some tips about cooking sweet treats with masa harina, Kat visits Fany Gerson at the Flatiron location of Dough, her hand-made donut shop. 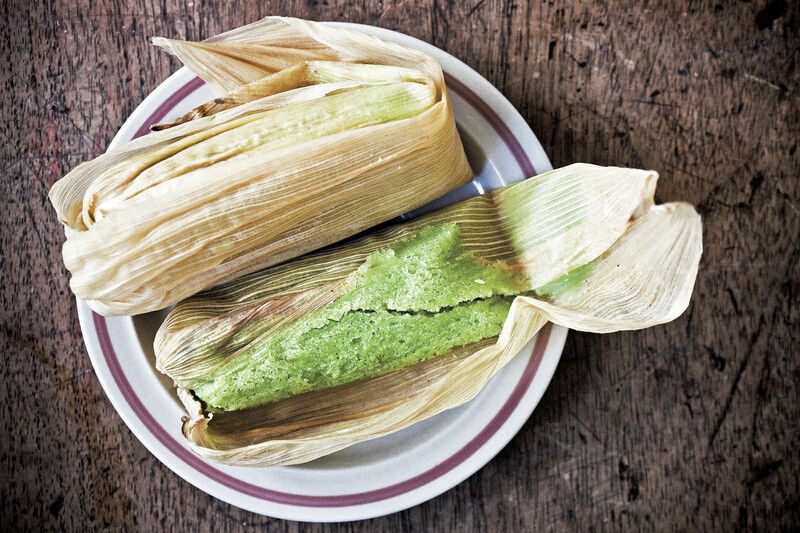 Fany is one of the most authoritative voices on Mexican pastries and frozen desserts, and she shares a recipe for Tamal de Limón (Lime Zest Tamales) from her first book, My Sweet Mexico. For a few years now, my dad and his partner Manuel have made an incredible Día de los Muertos celebration in a country house located near Cuernavaca. They invite friends and neighbors, attempting to preserve the culture that many children in big cities confuse or associate nowadays with Halloween. Hundreds of assorted tamales and hot chocolate are always made to welcome the guests as they come to visit the awesome ofrenda. One year, Mrs. Catalina, the charming woman responsible for the tamale feast, kindly showed me how to make them (although she didn’t let me touch the batter because she said it would separate). The lime zest ones were my absolute favorite and remind me of a very light and airy sponge cake. The bit of shortening helps give it a wonderful texture, but you may substitute more butter if you prefer. Rinse the cornhusks under cold water, place them in a bowl, and cover with boiling water (put a plate on top and weight it with a large can to keep them submerged). Let sit for at least 30 minutes, or until soft. In a bowl, combine the butter, shortening, and sugar with your hands or in a mixer with the paddle attachment until very creamy. Add the masa and mix well (it’ll look a bit like coarse meal). Combine a few drops of the food coloring with 3 tablespoons of the milk, then add that and the rest of the milk gradually while mixing until incorporated. Stir in the lime zest and salt. Drain the cornhusks and scoop about ¼ cup of the batter into a husk, spreading it with the back of a spoon and leaving at least 1 inch all around (a little more on the long sides). If the husks are too small or broken, put two together and overlap them. Fold one of the long sides toward the center, and then fold the other long side on top. Tuck the exposed sides underneath; if they are still too small, wrap the tamale in another husk and tie it with a thin strip of husk (this isn’t necessary but is just an extra precaution). Repeat to use up all the batter. Fill a pot with enough hot water to reach just underneath, but not touching, a steamer (you can use the collapsible kind if you don’t have a special pot). Cover the bottom of the steamer with leftover cornhusks and arrange the tamales vertically, standing them up so they rest against one another. Cover with any remaining leaves or scraps, cover with a lid, and cook over medium heat until the tamales slide out of the wrappers, 1 to 1½ hours. Add more boiling water to the bottom pot as needed to make sure water reaches the bottom of the steamer. Serve warm. The tamales can be stored in the freezer, wrapped tightly, for up to 3 months. There is a theory that many home cooks firmly believe in. To test whether the dough has been beaten enough and is ready to be put in the husks, put a bit of dough in a glass filled with cold water. If it begins to float, it’s ready and you can be sure that your tamales will be light and fluffy. If it doesn’t, just beat a bit longer. Reprinted with permission from My Sweet Mexico, by Fany Gerson, copyright © 2010, published by Ten Speed Press, an imprint of Penguin Random House LLC. Photographs copyright © 2010 by Ed Anderson.